I was out and about with my friend Jane, and lost track of the time. Now that we're home and have had time for tea, I can fill you in on a bit more of our wanderings in the past few days. 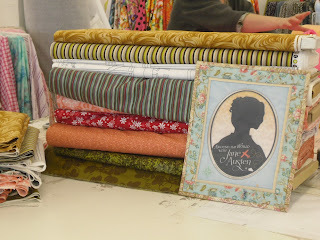 After finding out that Jane was a quilter, I had to take her fabric shopping. We picked up my mom and went to Fabricland to collect the gift certificate that I had won a few weeks earlier. 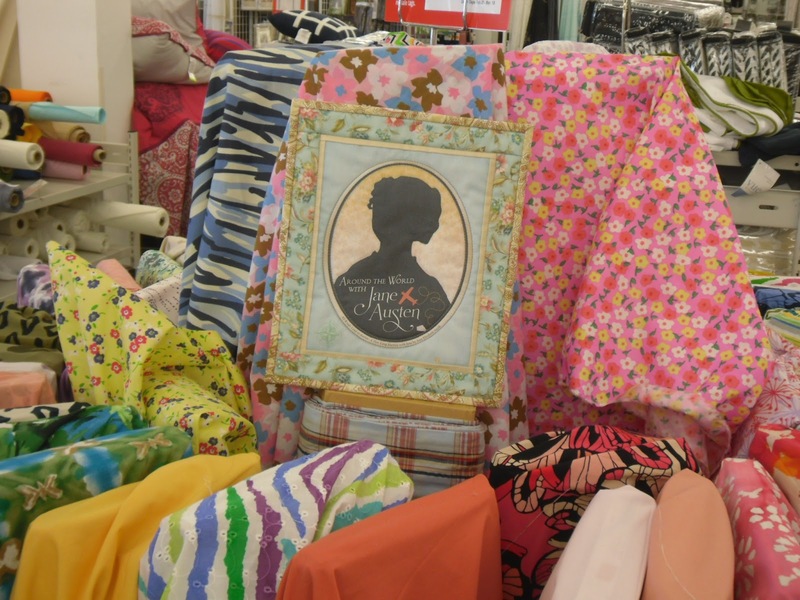 We had lots of fun selecting an assortment of cottons. Jane was impressed with the wide assortment of colours and styles that are now available. She said that in her time she was much more limited in her choices, though she reassured me that she was still able to find some beautiful pieces. The second photo shows some of the fabrics that I bought pieces of. I'll be sharing these with my mother. No, they won't be going together in the same quilt as they are just so different from each other. After our intense shopping it was time for a break. 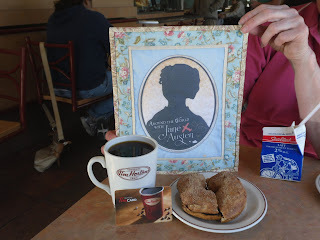 Mom and I felt it was time to introduce Jane to Tim Horton's. 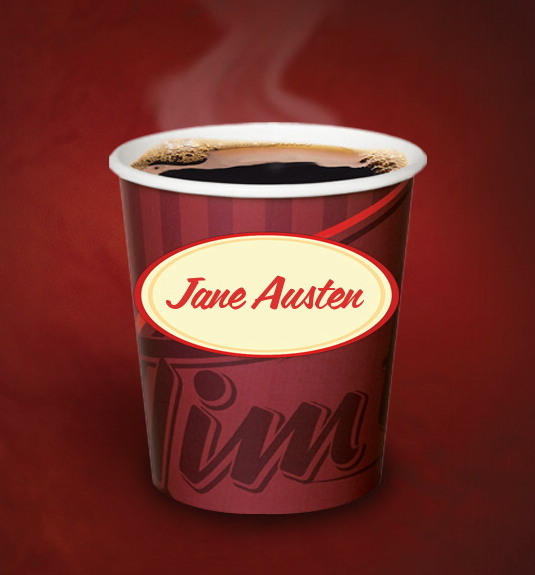 For those who don't know, Tim's is the most popular coffee shop in Canada with over 3000 locations. Not sure of her preferences, I suggested that Jane order a coffee and toasted French Toast bagel. She replied that she doesn't usually drink coffee so late in the afternoon as it keeps her awake for some reason. I explained to her about caffeine and that it is a stimulant. When I told her that several processes have been devised to remove the caffeine from coffee and that you can now enjoy the flavour without the late night jitters. She was overjoyed and changed her order to decaf. Tim Horton's was so thrilled that Jane Austen visited their restaurant, that they created this special cup for her use. To personalize your own cup, visit their Facebook site. Jane just had to model the ruffle scarf that I finished last evening. It's for a friend who loves the combination of black and white. 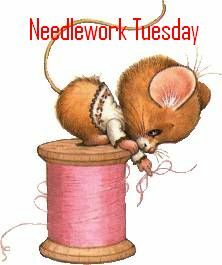 I used one ball of Bernat Twist & Twirl knit on 4.5 mm needles. French Toast Bagel sounds delightful. Wonder if that is one of those don't-try-this-at-home items. Looks like you had a nice day. Enjoying your photos. Being British, Jane will be accustomed to the fog and rain, which I am sure she will experience while she is in Halifax. Loving following the adventures of Jane. Jane looks very much at home in the fabric shop!